With the Mariners recent success, I thought I’d give them a try, in the most casual way possible. Record the games and then watch them mostly on fast forward, pausing when something of interest occurs. Lately, that has meant watching most of the game. Baseball on TV is different now. It is still too slow, but fast forward helps with that. The big difference is the amount and depth of the statistics displayed on the screen. It is captivating, especially for anyone (like me, for example) with math nerd tendencies. When a pitcher enters the game, the screen will tell you what pitches he throws (fastball, curve, slide, change-up) what percentage of the time, depending on the balls and strikes count. This info is available to the teams as well, I’m sure, and what an advantage! If the numbers tell you the pitcher throws a fastball 93% of the time when behind in the count, and the count is 3 balls and 1 strike, guess what pitch the batter will be looking for? The screen is filled with sidebars of all sorts of arcane statistics that only the obsessed would collect, but I am happy to see the results without doing any of the work. For one thing, this allows baseball to bring to the viewer the history and tradition they want to market in an open and interesting way. As an example, there is one statistic displayed that shows that in one area the Mariner’s offensive success was last equaled by a team with Babe Ruth and Lou Gehrig playing! For the casual fan, nothing creates more interest than offense and home runs, and here the Mariners are rollicking along at a pace that cannot possibly be sustained. They have hit at least one home run in every one of the first 15 games, an all-time record, and are averaging over two home runs a game and over 7 runs a game. Frequent statistical records show you how they are comparing (favorably) with teams from the past 100 years, in a cornucopia of other categories I did not know existed, but are fascinating. They do not show, at least so far, negative numbers, such as the number of errors committed, which is not a Mariner bragging point. Their success is even more fun because the team is comprised of a bunch of guys you’ve never heard of most likely. One (Edwin Encarcion) is probably ending a long and successful career with the Mariners, and unlike most of his end of career predecessors he is eating the opponents alive. The rest of them, for a fan of my low standing, are literally “who are these guys?” You have to like the underdog. The Mariners currently lead all of major league baseball in a slew of statistical categories, and it is not just one or two players doing all of the heavy lifting, but more like a dozen of them and all are having career years. On a long road trip, the manager has been blending in different players each game. This provides a day of rest for a player who does not want it because he is doing so well, but also allows another slavering beast to get a turn or four at bat and join in on the feast. It’s interesting to observe. Today’s game added a new wrinkle. The Mariners were behind by several runs for most of the game, finally tying the score in the 9th inning and then scoring the winning run in the 10th – on another home run. They are now 13 – 2. Can this continue? No. Certainly not at an average of almost 8 runs a game, nor almost two home runs a game. The Mariners bandwagon has emptied so often before it does not bother with seatbelts, but still they are great fun to watch. I have a suspicion they are not going to dry up and blow away. I purchased a 2016 Triumph Bonneville T120 in April of that year. The following situation has occurred so often that I almost laugh when it starts…again. Someone, usually a man, notices the bike, whether at a stop light or when I am parking it at the store or getting ready to leave from some place. A long stare commences. The person usually looks a little astonished, and then goes on to relate their personal connection to the Triumph Bonneville. They had one, or Dad did, or Grandfather, or a relative. The stories are always slanted a bit with the golden rays of reverie. Evidently none of the originals ever broke down, crashed, or leaked oil! Then there will be a remark or two about how beautiful it is, and then my favorite part – the questions! Then I start reeling off the improvements. “It also has ABS brakes, triple discs at that, fuel injection, ride modes, heated grips, several instrument displays, an easy clutch pull, and 10,000-mile oil change intervals.” And sometimes I gush more. By now the person is back to staring. They usually wish me a good day, and then wander off, turning back a few times to gape at the bike some more. Why do people react this way? For one thing, the Bonneville is a beautiful bike in the mode of classic bike looks. Jay Leno is reputed to have said “A real bike you can see through.” But there are lots of beautiful bikes. I think Triumphs have a look that communicates fun and adventure and friendly. People assume the rider is friendly. Lot of Harleys are beautiful, but they can also look intimidating or unfriendly depending on the example. I used to ride a lot of Harleys as part of my job at a dealership, usually showing off a new model at an event, and while people did talk to me (which was why I was there), it was much different and more restrained. I owned a scorched yellow Speed Triple for eleven years, and it was a fantastic bike that hardly anyone ever commented on. I go on lots of rides with small groups of friends. 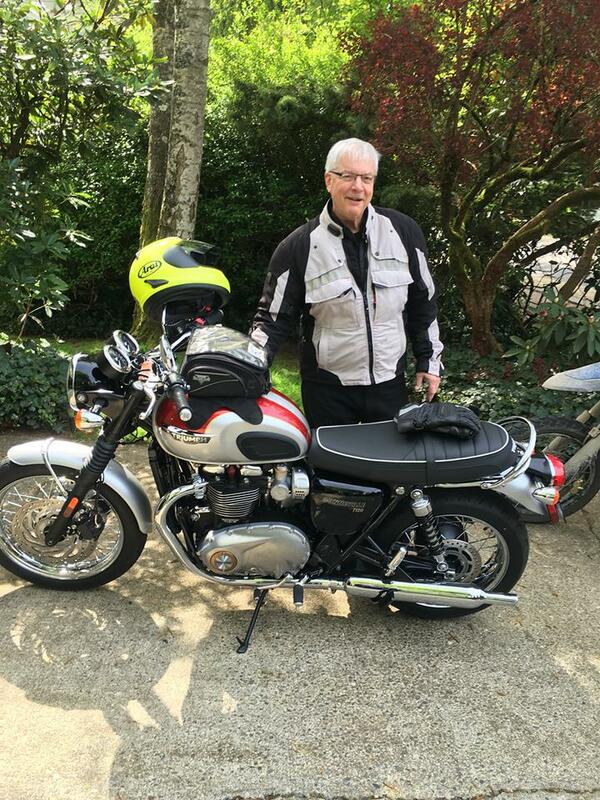 They all have nice motorcycles, but none get the reaction mine does, except for the friend with multiple old – Triumph Bonnevilles. My friends often make amused comments about the delays in our ride when we stop or go to leave, because of these conversations. Certainly not the reason to purchase one, as there are many better ones, but a pleasant little sidebar. Ride fast, ride safe, and ride often! How Much Technology Do You Need – Or Want – In Your Ride?Eons ago, when I first got entranced with cards and motorcycles, in about 1962, “technology” rarely surfaced in discussions of cars and motorcycles. After all, most motorcycles of the time were basically a reinforced bicycle frame with an engine and fuel tank bolted on, telescopic front forks, rear shocks, and drum brakes. Most cars of reasonable price were at about the same level of sophistication. In those days, most drivers and riders wanted, in a word, more. More power, more brakes, more handling prowess, more reliability, and on and on. My first motorcycle was a 1965 Yamaha YDS-3 250cc two stroke. It had drum brakes, 24 horsepower on a good day, and handling was handling. It was a fine motorcycle for its time, and I rode it for thousands of miles, including a camping ride from Minneapolis to Seattle and back in 1968. In the 1970s things began to improve in so many ways. Horsepower levels for motorcycles increased exponentially, often far beyond the capabilities of the chassis. The Kawasaki 750cc two stroke earned the name “widow maker” sort of by accident, and by that, I mean a lot of them. Cars had seen major increases in horsepower in the 1960s. This peaked in 1970-71, and then fell back in 1972 – 1973 as the emissions standards came into play. It would take years for cars to become exciting again, which is why you will see very few late 1970’s performance cars at collector car auctions, particularly of American manufacture. In 1977 I purchased my first brand new motorcycle. It was a 1977 Yamaha XS750D triple. Three cylinders, shaft drive, triple disc brakes, self-cancelling turn signals. At the time, a state-of-the-art machine. Of course, the shaft drive made it heavy, the rear shocks were built to a price, and it made, 64 horsepower. S&W rear shocks, a copy of a BMW R90S fairing, lower and narrower bars from a European Norton, and K&W air filters turned it into a fine machine. The triple points ignition was a pain to fiddle with, but all in all I rode it for 21 years and almost 50,000 miles with virtually no mechanical problems. In the 1980’s came more improvements in both cars and motorcycles, and the word technology began to appear in articles and road tests. Obviously, I am skipping over a lot of detail. I will get to my point…eventually. In the early 2000s things began to change, as the intrusion of electronic and computer improvements began to radically alter the design and performance of both cars and motorcycles. The Kawasaki 1200 Ninja I owned turned 165hp at the rear wheels on an honest dyno, and was still at 160hp with 98,000 miles, according to the guy who bought it from me. It could accelerate in 2nd and 3rd gear so hard my eyes and brain had a hard time keeping up. Electronic fuel injection, Akropovich titanium exhaust, a Power Commander, and on and on. In the space of 35 years, the crank horsepower available to anyone with some cash had gone from 24 to almost 200 – roughly an 800% increase! But then things began to change. Motorcycles and cars that were to be used on the street no longer had the need for “more,” except in the egos of the owners. I had a colleague at Cycle Barn in the early 2000s, a Harley enthusiast, describe to me what he was going to have to do to his next Harley, and how much it would cost, to get the engine to 100 horsepower. I replied “Or, you could just buy a Honda 600cc sport bike for the same money, and all the rest of the bike would be free.” He was not amused. As engineer boffins learned what could be done with electrical circuits, sensors, and ever smaller computers, their attention turned away from mere horsepower to gizmos and gadgets designed to improve the driving experience (their words) or find new ways to build cost and profit into vehicles with things that were never needed in the first place (my words). Do I need a light in the outside mirror to tell me another car is there? I had a rental car that created the worst of two worlds – a light that came on in the mirror if a car was detected in the next lane – some of the time. I once had a pedestrian Hyundai rental car of perfect utility – with paddle shifters. Really? Why? In 2009 I had the opportunity to turn some sort of fast laps at (then) Seattle International Raceway, with an SCCA race instructor riding shotgun, in a new Mercedes Benz 500 AMG convertible. The Mercedes had a veritable “suite” (marketing hype) of safety technologies. None of them could be turned off. Of course, it was an automatic. On a racetrack the car would resist any attempt to rotate in a corner. It would apply the brakes at the wrong time, because the little molecules of its brain were convinced I was crashing. It was frustrating, and I began to wonder what someone would have to do to actually crash the car. In about 2011 or so the US Navy discovered that more personnel were perishing in motorcycle crashes then from any other cause. World wide. Young men and women were being highly trained in the maintenance and operation of extremely sophisticated and expensive equipment. When they came home on leave, flush with cash, they would saunter in to their local dealer and purchase the fastest bike they could find, usually ignoring advice to take a rider class, which was not required at that time. Their thinking was that if they could maintain or operate a fighter plane or aircraft carrier, how tough could it be to master a 500-pound machine with a mere 165 horsepower? As the Navy moved to correct this, a motorcycle safety instructor and I were invited to go for a group ride with sailors from the Everett Naval Base. It was utterly appalling! All nice young men and women, but almost all of them clearly had no idea of what they were doing. Their cornering lines were all over the place, braking far too early or late, no concept of body positioning, and on and on. It was amazing. The Navy has since mandated motorcycle rider training, and the other branches have hopefully followed their lead. And now to today. One of the problems is that while technology had transformed many forms of transportation in the last half a century, most of the road infrastructure is unchanged. You can now purchase many cars and motorcycles that cannot be driven anywhere near their limits on public roads, to say nothing of the talent of the owners. I once knew a nice man who owned both a new BMW S1000RR and a new Porsche 911. His wife joined us at a track day at The Ridge in the 911, and I was pleased to see it had a manual transmission. Both of them drove the Porsche at car track days. He explained that his friends wondered why he had not purchased the much faster Porsche GT3. He explained that at a track day at Pacific Raceways, Don Kitsch, a pro driver and operator of a racing and track day school, had done a few laps at full chat in the 911 with the owner as a passenger. This taught the owner that he was 5 to 10 seconds a lap slower than the car was capable of. Why would he need a faster Porsche when he did not have the talent to extract even close to the maximum capability of what he had? Did you know there is a group known as “Save the Enzos”? There are a lot of You Tube videos of Ferrari Enzos coming to an ignominious end when the driver wrote a check neither his talent or the road could cash. And that is only with a rare and incredibly expensive car. There are tons of other examples. Now we are faced with an ever-expanding menu of driver “aids,” as well as electric cars and motorcycles. This may or may not make the car safer, depending on your point of view, by turning over more and more functions to the widgets in the electronics systems. How much technology do you need? How much do you want? You first need to define for yourself what a car or motorcycle is. For me, all electric vehicles are not cars or motorcycles. (Your results may vary). I refer to them as “TD” s – transportation devices. Many of them are supremely capable, equal to the performance of a car or motorcycle. In the near future they will probably surpass the capability of vehicles powered by the rotten and compressed remains of dinosaurs. A Tesla set to “ludicrous” is evidently an amazing experience. Matters not a whit to me. For some, driving or riding is an experience, and one to look forward to. Electrics offer seamless performance with little or no sound and (usually) no need to shift or do much of anything but sit back and enjoy the ride. They do an admirable job of getting from point A to B with a minimum of hassle and stress. And involvement. Most of my friends are gaga about the present performance and future potential of electric motorcycles. I rode one once, and it did everything it was asked to do perfectly. So does my vacuum cleaner. So, let us choose to turn back to “normal” vehicles. Am I suggesting a return to the technology, what there was of it, of my youth? No. Instead, it might be better to think about what technology you want and what you do not want, and purchase accordingly. For me, I want every drive or ride to be an event. Nothing too dramatic required, but I want to be aware that I am operating a machine, and not just sitting in a pod having all of my needs attended to my unseen servos and sensors. I am in favor of technologies that make my car or motorcycle safer to operate, more reliable, more efficient, and/or better looking. To that end, computerized fuel injection, water cooling, cruise control, triple ABS disc brakes, traction control, light pull clutch levers (motorcycles), and air bags (cars), are all things I want. These days, of course, it is almost impossible to find a vehicle that does not have all of these. Most of the technology that I do not want comes from engineering and marketing departments looking for new fripperies to differentiate their product from others. Unlike 50 years ago, it is very hard these days to purchase a truly bad new car or motorcycle. Most vehicles today are well made and have performance at least adequate for the roads they will be used on. The problem for marketing mavens: How to make your product stand out – add-ons that you can tell the consumer are super important. Are they? I do not need the latest thing in GPS directional systems in my car or on my motorcycle. Neither do you. If you have the money for a new vehicle, you own a cell phone. The technology of cell phones evolves much more rapidly than a vehicle production cycle. My (now) ex-brother in law has a company car. This vehicle can parallel park itself and also maintain a safe distance to the car in front when in cruise control. This has had two affects. He admits he is now losing his ability to parallel park. Worse, when he is driving one of his other cars in cruise control, he expects the car to slow itself when traffic slows in front of him. The other two cars do not have the speed adjust technology, and a couple of near accidents have been the result. So are these two technologies a gain for the majority of people in America who operate more than one vehicle? How many cup holders do I need? Actually, none, but any car will have at least two of them. OK. I do not need blue tooth or whatever tech in my helmet to inform (interrupt) me while riding. One of the reasons I ride is to be away from the latest breaking news, and phone calls, etc. I do not need or want any piece of technology that makes noise to warn me of something that should be obvious. Lane departure warning systems, warning lights in the side mirror, a steering wheel that shakes if it thinks I am in error, a beeping sound when the car is in reverse, or a gong that tells me the car is moving and the seat belt is not fastened. I do not want or need a complex stereo or entertainment system that accepts all devises and syncs to my phone. I do not need or want a CVT transmission on anything, or an automatic unless the vehicle is a mundane SUV or truck. In short, I want to experience the vehicle I am operating. I want to be engaged and involved, and I do not want technology to be used to separate me ever further from being connected to the whirring bits that are propelling me down the road. The proof is in the pudding. What do I own, you ask? A 2016 Triumph T120 Bonneville and a 2012 Fiat Sport with a 5 speed manual transmission (of course). Both are examples of what this essay tries to point out. Cheers! Ride fast, ride safe, and ride often! By the way… It has come to my attention that if you are reading this on a smart phone my entire website does not display. Among other horrors, this prevents you from clicking on and ordering any or all of my 8 books available from Amazon. You must go to www.davidpreston.biz on a computer to slake your thirst for essays and novels that feature (mostly) motorcycles and cars. I’ve been hearing this expression since I was… a kid, usually uttered by adults with a shake of the head, followed by a litany of complaints. Kids have no respect, they do not listen, they have no work ethic, they are lazy, their music and clothes are terrible, and on and on and on. I first noticed this when I became a junior high teacher and noticed that the remarks of adults sounded remarkably like the remarks of adults a decade earlier, when I had been in junior high. And the exact same remarks are still heard today, more than half a century later. There are many reasons for this, which I will not bother to enumerate, but it has always been curious to me that so many adults do not hear themselves repeating the words of their parents or grandparents. A. = AUDIENCE – who, exactly, are you trying to reach? P. = PURPOSE – what are you trying to get done? When I first walked in to the large church complex being used as the convention center, I thought there must be some strict form of dress code. The young men and women were clad in outfits that were almost uniformly black and white. Turns out that today, for most young people, dressing up means black slacks and a sport coat and white shirt, and a black skirt of slacks with a white blouse and maybe a black sweater. In any case, they all looked very nice. The speaker before me was an FBI agent talking about careers in the FBI, and I amused myself noting his mistakes. For one thing, he was very soft spoken. The coordinator had noticed this when he met him and had offered a mike, but the agent thought he would be fine. He was not. Even with my hearing aids in I could not hear a word. Then he went over his time. By quite a bit. A lot of the students had to leave to enter a competition or get to the next speaker, so by the time he was done he had lost at least half of the crowd. When my audience arrived, I was immediately impressed. The first three were young men who passed the wait time poring over a biology book. Once I began, I immediately noticed that all were paying attention. I am a good speaker, or so I have been told, but this was for an adult they had never seen before, which is usually a tough teen audience. At one point, for an example, I asked if any of them played any sports for their school. Several raised their hands, and the girl I selected said she ran track. I asked if she was good at it, and she nodded yes. I found out later that she is one of the best runners in the state- good selection on my part. The example had to do with thinking about your audience, and how different your essay would be if you were communicating to an audience of third graders about track, or college seniors preparing for the Olympic trials. As time ran out there were a couple of intelligent questions, and two of the students paused on the way out to tell me mine was the best presentation they had heard that day. I took the time to talk to a few students, especially the rebels wearing other than black. Every student I talked to looked me straight in the eye (this is often difficult for teens) and answered me with enthusiasm and wit and humor. You could argue that this was not a typical group, and to some extent that would be correct, but not much. These are not rich kids from an exclusive private prep school – just high school kids who happen to be in a business class or after school marketing club. With all the fears we have for the future, given the gang of immoral scoundrels trying to ruin our country, I think we will be OK. The kids are just fine. This is written especially for all of my friends back in Minnesota, land of my youth. They must wonder what collective insanity seems to hit people in the Seattle megalopolis when snow hits. But there is a bit more to it. Snow is not snow. I recall reading decades ago that Eskimos have 97 different words for “snow.” I have no idea if that is true, but it makes sense to me. The snow we have here is far different than the snow I grew up with. When it snows in Seattle the temperature is usually close to freezing, and often meandering a few degrees above or below, often several times over a two- or three-day period. And sometimes there is rain. This creates multiple layers of ice and snow and water and ice and snow – a cake that reduces traction to where even walking down your driveway is perilous. Because this does not happen every year, people seem to drive faster than they should, as if reducing the time spent driving will make it safer. It does not. There are other issues that impact us as well. The snow that falls tends to be extremely moist, and thus heavy. This leads to power outages and downed trees all over, and some of the trees have the poor taste to penetrate the roof of the house. Because snow is not an annual occurrence, local governing bodies cannot justify massive sums of tax dollars in infrastructure. There are few snowplows, and a sanding truck might get to your street – never. So, there you have it. Today the locals are trying to find an excuse to leave work, as the snow is about to begin… again. Grocery stores yesterday were pretty much stripped bare of milk and bread and eggs and beer – the basic food groups. The amusing final touch is that our weather is extremely hard to predict. Great weather forecasters want to work here for the challenge. Others opt for Los Angeles, where the weather forecast resembles a looped film. As a result, the “snowmageddon” that everyone talks about at times never arrives, and then people vent their fury at the hapless weatherfolk, fooled by Mom Nature again. PS: Use your computer to access my website at www.davidpreston.biz, as I am told the entire home page will not show on many cell phones. There you will find all sorts of things, and links to allow you to purchase any (or all) of my 8 books from Amazon. If you are home-bound for a bit, this would be a good way to spend your time. Spring is coming…eventually. It has come to my attention that if you are reading this on a smart phone my entire website does not display. Among other horrors, this prevents you from clicking on and ordering any or all of my 8 books available from Amazon. You must go to www.davidpreston.biz on a computer to slake your thirst for essays and novels that feature (mostly) motorcycles and cars. I enjoy all the hot rod build shows on TV. If I had the mechanical skills and money to match my ideas, I would love to make them myself. The final episode of “Fantom Works” involves an extensive rebuild of an old work truck and is a two-part episode. Evidently this will include the installation of a remote-control ramp that will come out of the truck and down to the ground to allow the loading of a motorcycle. I have never seen this done, but I invented such a device for a custom truck in “Triathlon Ride,” my second to last novel. The custom truck also appears in “Farrier Ride,” my last effort. (so far) Can’t wait for the final episode to see how their reality matches up to my creation! Oddly, their vehicle and mine are both based on an International Harvester truck! What are the odds? More dark metallic green, with an oblate spherical cream area on the door with the company logo and Bartholomew’s name. On the hood, a reverse hood scoop from a Camaro drag racer from years back, and on each side of that the word “Daphne” in small but elegant pin-striped cream italics. He pushed a button and Daphne’s engine rumbled to life, murmuring peacefully through big exhaust pipes. “Excellent guess, Harrison.” He punched another button on the remote and the hood rose silently, revealing a modern fuel-injected engine with “Camaro” announced on the valve covers in red. A 3rd button push popped open the driver’s door to reveal the leather interior. Although the dash appeared stock, I could see that a lot of the more modern controls, such as cruise control and the stereo, were close to hand on the leather steering wheel. Daphne also sported power windows and door locks. We’d strolled to the back, where the extra length eight-foot bed glistened with varnished wood pieces separated by aluminum slats. The center slat was wider, with a slot running down the middle. It seemed to sit several inches higher than normal, so I asked about it. Bartholomew produced a wry smile and punched yet another button on the remote. The bed split in half and rose up vertically on each side, jutting above the original body sides. As this was going on, a second layer was exposed under the wood, this one all aluminum, but with rubber traction surface areas up and down both sides. A shallow notch ran down the middle, and as the sides raised a chock for the front wheel of a motorcycle popped up in place. The tailgate began to move to the rear an inch or so and then slid down until it was vertical behind the Parkerized rear bumper. The entire aluminum bed panel then began to slide backward. As it cleared the back of the truck it gradually leaned down until it rested on the cement floor. The last bit of it was beveled. When all was said and done Bartholomew hit the kill switch on the remote, and now he had a pickup ready to be loaded with his bike. He could easily ride the bike up and into the wheel chock, and then get off and walk back down to level ground. Then the remote would reverse the process. A couple of tie downs could be added for security, although they were probably not needed. There was a soft click as the hood, released by the kill button, settled back into position. For more on why the truck is named Daphne, and who Bartholomew is, you will have to purchase the book! $10 in paperback, $5 as an e-reader, or you can “borrow” it for two weeks for free if you are an Amazon Prime member. Anyway, I am eager to see how the real version comes out on the TV show. Addendum:ow that I have seen the show, I think my design was far superior! Now to win the lottery and see if a hot rod shop can build “my” truck. If you own a Triumph, it is presumed that you enjoy riding it, as with most other brands of motorcycle. Sometimes you have the thrill of a lengthy ride, and probably more often an all-day adventure. But sometimes a shorter ride beckons. Perhaps you do not have the time for a lengthy journey, or just want to clear your head of the daily clutter that life can create. Where to? If you have lived in the same area for decades, as I have, this can present a challenge. So many of the likely destinations have that faint odor of “been there, done that” about them. I have solved this issue for myself, and you are free to borrow. I look through real estate ads and find a couple of homes for sale that I could never afford unless (until?) I win a large lottery. I look at the location, and then type and print the address of one or two of them. Then I cut up the print-out into a smaller piece of paper that goes in the clear map pocket of my tank bag, and I’m off on a quest. Of course, if you tried this you could use a GPS and navigation program on your motorcycle or phone, but that would miss the point. What you want to do is engage mind, body and motorcycle in the thrill of the hunt. A Triumph Bonneville is ideal for this sort of thing. There’s enough power to get to your destination at a goodly speed on the main roads, but also the capability of easy handling in low speed corners and the ability to do U-turns with ease – and you will probably do a lot of U-turns. Being a home of great value, you are either going to be out in the country where not all roads are marked clearly, or in an upscale housing area with multiple dead-end roads. The steel fuel tank makes the use of a magnetic tank bag easy, and the seating position is comfy at all speeds. One of the things you will discover is that most of the expensive homes you find will not make the cut for your taste. The real estate ad might not show the steep driveway you do not like, or the fact that the home sits at the bottom of a valley on two sides and is rarely if ever blessed with sunshine. Or a dozen other factors that pertain to your personal criteria. Just today I eliminated a $4 million house and a $2 million house! But the houses are not the point. What you get is a nice ride, and better yet, on roads you have never ridden. Best of all, you will probably discover a few winding and empty back roads that have been there all this time and have escaped your notice. Most of the off the driven path roads that I lead friends on have been discovered with this method. Give it a shot. For added spice – always own a current lottery ticket. You never know when your hunts could turn serious. I know- what a strange title for an article from me. But there is an explanation. Let me be clear about my opinion of Donald Trump. The man is not only the worst President in United States history but also heads up the most corrupt administration in our history, which is saying quite a bit. He is also a liar, a tax cheat, a serial abuser of women, and a business person with decades of history of cheating almost everyone he has done business with. He is a disgrace not only to the office he holds, but to humanity. But… Tuesday the news broke that a friendly podiatrist had diagnosed him with bone spurs in the 1960’s, which kept him out of the draft and well away from the Viet Nam war. The physician had evidently done this as a favor to Donald Trump’s father, who also happened to be his landlord. And so another scandal begins to play out. And that is where I have to squeak a bit of reality. It is hard for people to grasp today just how unpopular the Viet Nam war was with many Americans. Those who did serve came home to shameful treatment. They were unfortunately abuse targets that were accessible, whereas what people really objected to was a long pattern of exaggeration and outright deceit carried out by top military brass and the U.S. government. The reputation of the military was so different from what it is today. This was the time of the awakening sexual revolution, civil rights upheavals, rock and roll, and greater availability of “recreational drugs.” A war in a far away place that seemed to offer no threat to us had little chance of gaining favor with people occupied with other pursuits, whether ill or good. There were all sorts of ways to try and evade the draft, and some people, like Donald Trump, squeaked through by the intervention of a physician. So did I. It is likely Donald Trump never questioned the doctor’s decision, and he may have been ignorant enough to believe it. In any case, there was little cause for him to dispute it. Same for me. I spent a few days in the hospital in December of my senior year of high school after walking home across a frozen lake after several hours of hockey, my clothes soaked with sweat. I got seriously ill, and the hospital determined that I had an inflamed pericardium (the outer lining of the heart), possible pneumonia, and other ills. They finally called it rheumatic fever and sent me home for two weeks of enforced bed rest. In college I needed a physical as part of the draft process. Doctors at the University of Minnesota told the Army that I had a heart murmur, and that got me a medical deferment that lasted all the way to my senior year. At that time the Army called for a second opinion, and the 2nd doctor scoffed and declared that I had a slightly unusual heartbeat, but not a heart murmur, and that there was no reason not to declare me perfectly fit for duty. True, that doctor’s time was paid for by the Army, but it did not really surprise me, as I had always thought the heart murmur story sounded a bit off. What had happened? The two doctors who had seen me at the University of Minnesota were both women, which was unusual at that time. They had been to medical school with the man who had been my family doctor my whole life. They revered him because in medical school he had treated them as actual people and fellow medical students, not the “female freaks” that most others did. So, they exaggerated my condition as mark of respect and as favor to him! Do I feel guilty? To an extent, yes. I have been to the Viet Nam Memorial in Washington D.C. and wept as I ran my fingers over the names of high school classmates. Some were friends, and some not. I remember one who had disgusted me by getting caught cheating on a test in our Advanced Math class. Now he was dead, and I was not. So were all the others. I have never watched any of the movies spawned by the Viet Nam war as a very small token of respect for those lost. I had housemates in college who were drafted. Most came from rural communities. If you were from a well to do suburb that valued a college education (like me) you were far more likely to be granted a deferment. None of this was fair. Women did not need to register and none was drafted. So flawed a system. None of it was right. These issues comprised a small corner of the tower of animosity toward the war at the time. Although I had little involvement in the civil rights movement, and none at all with the sexual and drug revolutions, I still benefited from the prevailing sentiments of the time, as did thousands and thousands of others. Later, after I had graduated and moved to Kirkland, Washington to begin my teaching career, I was declared 1A (prime meat). I had just broken my shoulder while destroying my first motorcycle. The school district appealed, using the argument that I was the only person the school district could find that could teach English and coach tennis. This went absolutely nowhere with a draft board in Minnesota, and the appeal was denied. The next month Richard Nixon held the first draft lottery, my birthday came up #334, and it was over. It is interesting that the story of Donald Trump’s fake bone spurs broke yesterday, and there was no mention of it in the newspaper today. Perhaps the editors, who are older, remember how many people evaded the war in any way that came along. In any case, I can’t castigate Donald Trump for this one. That leaves only several hundred other reasons why he should be removed from office. This is a tale where you get to provide any of several back stories and explanations. Sort of a choose you own adventure, except it does not (most likely) include you. I work out casually at the local YMCA four days a week. I was there Monday at 7am and again today. They were, of course, closed yesterday, as it was Christmas day. I always park in pretty much the same spot. This morning, as I left my car, I could not help but notice an unwrapped condom sitting on the damp paving of the parking lot. I am sure it was not there Monday morning. Questions began to fill my head. The YMCA closed at 3pm or so Christmas Eve, and was closed Tuesday, so the event that concluded with a discarded condom took place between late Monday afternoon and this early Wednesday morning. The YMCA sits in the middle of a large business park area, full of offices and small businesses, with the Seattle Times main building, a couple of residence motels, and so on. If you wanted to park with privacy, there are dozens of options, particularly in this time frame, when most of the businesses are closed. The YMCA parking lot has lots of lighting, much more than I would think desired for the presumed activity. By driving around, you could easily find a place that was totally dark or had only as much illumination as desired. The YMCA seemed like an odd choice. So, what happened? One friend pointed out that just because the condom was not in a wrapper does not mean it was used, which raises further plot possibilities. Or… what do you think? I thought it was hilarious, although the YMCA staff I reported it to did not seem amused. The evidence had been disposed of by the time I left for home. Next way will bring the same schedule. The YMCA will close Monday afternoon and be closed Tuesday, New Year’s Day. Will there be a repeat? Stay tuned! Facebook is often criticized, at times justifiably. My experience, however, has been extremely positive. This year has been “challenging,” to understate. In a period of a couple of months both of my children disowned me, for reasons that are not at all clear, and my wife filed for divorce, between my birthday and our 46th wedding anniversary. None of this made or makes any sense to me. In the blink of an eye my entire life was shattered. I went from an extended family of two children, their spouses, two grandchildren, one older brother, and (on my wife’s side), about 20 adults and children – to being able to communicate with one older brother. All of the rest of these people simply erased me from their lives. As the divorce crawls slowly toward a resolution and the sale of the home we have lived in for 41 years, probably in the spring, I am sort of camping out in a spare bedroom downstairs. All of this was shattering, and I could have easily fallen into a very deep depression, or much worse. I did not, and it is because of close friends, Facebook friends, and former students. The first few friends I opened up to all had the same reaction to what my family had done and what was being said about me: “This is nonsense.” A couple of them had “been there and done that” and provided me with excellent advice I have followed. I received a ton of support from Facebook friends, including former students, colleagues, and friends from my youth going back more than 50 years. I needed all of it. Of course, our lives are not complete without irony. For years I was overly smug about my reliance on a flip phone and a contrarian refusal to get a smart phone. My rationale, beyond my capricious ego, was that everyone else had one and I was usually not alone. This changed in 2016 on a solo motorcycle trip to California where I found myself in a situation where I really needed a smart phone with internet access and did not have one. Now I use that new phone all the time to keep in touch with people I rely on. What is the secret of comedy? Timing. You remember the line “teaching is forever?” Thanks to Facebook, it is more true than ever. Over the past few years I have received moving statements from former students thanking me for something I did, almost always not related at all to what I was teaching. In one case I had written a long letter to a girl whose life was falling apart. Her life trajectory continued downward until she was about to commit suicide. She pulled out my letter, read it again, and changed her mind. Four times. Years later she was in a much better place and wrote to thank me for what I had done. I was in tears by the time I finished her letter. I have received at least a half a dozen of these. On the first day of each class I would tell my students that in return for their efforts I would be there for them for the rest of their lives. It never occurred to me that the reverse could be true. Now I am wiser and so grateful. Not that all students adored me or even liked me. Some of them despised me, and in some cases I would agree that they should. Teaching involves making several decisions an hour. Unlike other jobs, the decisions involve the best technique to work with in dealing with a child, and children can be difficult to assess from moment to moment. At times I made the wrong choice, but I don’t get to hear from those students. Today I received another warm message from a student of over 20 years ago, detailing how I helped in what today would be called a “Me Too” incident. Like many of these stories, I do not remember the incident, but hearing that I did the right thing really bolsters my confidence and self-concept. I don’t mean for this to be about me, or a pity party palaver. (I like that). My intent is to show the positive power of Facebook, and the rewards of teaching. Cherish your friends on Facebook. There may come a time when you really need them. If you are a teacher, know that you make a difference. When your students are older and reflect back on their school years, they will remember the positive impact you had on their lives, and thanks to Facebook, may reach out to tell you about it. If you have a favorite teacher in your past, take the time to find them and thank them. I did this by phone in 2000 when I realized I had been copying virtually all of the teaching techniques of my favorite English teacher in high school. For 31 years. We had a wonderful conversation. So please do this. It will mean a lot – to both of you. Now go out there and do good things!